To qualify to compete in the 2018 National Finals Challenge you must have competed in 3 sanctioned challenges in each division you wish to enter. Futurity horses are not eligible to compete in any division other than the Futurity and the Futurity Classic at Nationals and do not have to compete in 3 sanctioned challenges prior to Nationals. A buy-in option is available for members that have not been able to meet the 3 challenge qualification due to the unavailability of an affiliate in their area. Contact AHCA office or visit the website for full details. Entry forms and Agenda can be found under the 2018 National Finals tab. This year we are electing five new members to the advisory board. Four members will serve a two year term replacing the board members that have completed their term. One member will serve a one year term, completing the position vacated by Brandy VonHolten. We thank all outgoing board members for their time and input on AHCA matters. Below are AHCA members who have accepted the nomination to serve on the advisory board. Please vote for five. A ballot is attached at the end and can also be found on the website. Your ballot can be mailed to AHCA, PO Box 350, Swartz Creek, MI 48473 or emailed to info@ahcamail.com or private message Rhonda Miller-Lebbin on FB. Only members with current regular memberships are eligible to vote. Please include your AHCA number (if you know it) on your ballot. It would be appreciated if you would return your ballot by February 18, 2018. I started riding horses with my grandfather before I could walk. I snuck out and climbed on my first solo ride at age two and a half. My mom gave in and I got a horse of my own when I was four years old. I started showing horses at age eight and won my first championship at the age of nine. Horses have been my life’s work since I started professionally training at age ten and continue to enjoy training horses and teaching people about these amazing creatures today. My favorite classes have always been cutting, reining, and trail. My office is filled with trophies and trophy saddles but my greatest accomplishments are found in the accomplishments of the people I have instructed over the years. I live, as I have always lived, just west of Zachary, Louisiana, near the Mississippi River on the beautiful property of Piddlers Paradise, the land of my ancestry. I have been an AHCA member and judge from its beginning. I have been an AHCA National Finals judge on 3 occasions. I am 23 years old and have been training horses for nine years. Rode under Carol Rose. Growing up in the Suburbs of Oklahoma City had its advantages. I had the best of both worlds, I lived in the suburbs, and my grandfather had an angus Cattle ranch in Welston Oklahoma. When I hit my mid-teens, I was already on my way to learning horses and very interested in the world of “blacksmithing”, Now known as Farrier. Watching how horses move, studying how the react, walk, paying attention to the conformation of what God had given them, I soon started going to clinics put on by Monty Robins, John Lyons, and Pat Parelli, learning how to get in the horses head and starting colts, and in my spare time from that I was studying under an old Farrier learning the business under the horse. By the time I hit my late teens, I had started breaking colts, and studying the art of Farriery. I went to work on my first Rach before heading to the Marine Corps in early 1989. In 1993 when I was honorably discharged. I then pursued the “Cowboy“ life, working Ranches, Feedlots, and shoeing working horses. I got to meet a lot of good cowboys, learning and studying their every move on how they rode their horses to how they worked their job. In 1994 I ran into an older man that I later learned was a multi-world champion trainer, named David DeArmond. He took me under his wing and started teaching me there was more to riding horses than just getting them to ride, work ranches, and rope. He started my carrier as a horseman, and shoe=wing me how to “teach” and horse how to do things, learn a job, and perform a duty to earn them oats they were eating. This was a whole new gig for me; I was just working hard, taking it all in, and learning as much as I could. In the mid 90’s I started training cutting horses, This just made my life, lol. I was on top of the world. After a severe injury to the knee, pelvic, and my head in 2004 I had to exit the cutting industry due to lack of finances. I still had my horseshoeing business, and breaking/starting colts to make a living. In 2008, I started studying under Dr. Rick Redden who is a world known Veterinarian that study’s nothing but the lower limb of the equine. My Shoeing business exploded, leaving me no time to ride outside horses, therefore retiring from professional training. In 2013 I was introduced to AHCA event. I was so intrigued from the comradery, horsemanship, and sportsmanship. I started competing in the challenges, and later that year became a judge after going thru the judge’s clinic put on by the president of the AHCA. I’m having a ball with the association and plan to be here for many years to come. AHCA Judge, Nicole Bourque grew up riding and competing on horses and mules. Today she is the wife of Cory Bourque and the mother of 2 amazing children, Hunter and Haylee. Nicole along with her husband owns and operates Cory Bourque Natural Horsemanship and Cowboy Dressage of Louisiana. They provide riding lessons, clinics, and horse training in Abbeville, LA. She stays busy with judging, announcing, and assisting/cheering on her family with their events. AHCA judge Clayton Cummings, grew up riding horses. It wasn’t until he was an adult that he began competing on his horses. Besides obstacle competitions, Clayton is an avid Team Roper. He has judged events for Christian Youth Rodeo, along with local county rodeos; when he wasn’t judging he was a pickup man. Clayton spent many years training, campaigning and judging horseback bird dog field trials. He has trained many AKC Field Champions and American Field Regional Champions. After 30 years in the Carpenters Union, Clayton was able to retire; but a retiree he is not. Clayton has been a Farrier for 28 years and an Equine Dental Specialist for the past 6 years. Clayton and his wife, Windy, have hosted many different horse events at their place. Their desire to see the AHCA grow, lend them to become affiliates in Kansas and established the Heartland AHCA. Clayton enjoys visiting with members of AHCA and others in the horse industry about AHCA and believes in promoting AHCA in a positive manner. Debbie Murry 54 years old I have lived my entire life in the saddle. My childhood was spent on horseback riding with my family and friends. I grew up competing at local horse shows and 4-H shows throughout Kansas and Missouri, where I won many yearend high point awards and state championships. I continued my equestrian interests after high school by working at a hunter/jumper/dressage stable as a groom, and exercise girl. Part of my job was to train off track thoroughbreds to jump and because of this, I got to work closely with veterinarians, Olympic, and international trainers. I then moved onto an apprenticeship opportunity at an Arabian and Saddlebred horse breeding/show barn. I worked up to the position of assistant trainer and breeding manager. We stood three stallions at stud, bred 75 outside mares and foaled out 20-30 mares/year along with a very hectic national show schedule. I am now married to a wonderful husband, we have two beautiful daughters, and our horses continue to be a family project. 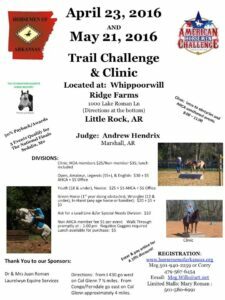 I have continued to breed, train and show our horses in APHA, NRHA, and local horse show circuit competitions, and more recently I have become interested in the trail/obstacle challenges competing in ACTHA, ETS, and currently AHCA. I have been involved with many local breed organizations and served on many committees within them. I continue to stay current with issues in our industry. I created and manage a Facebook page, KC Horse Events to share information with other equine enthusiasts in the Kansas City area. I enjoy learning about new ideas, and training methods, and of course I really enjoy the many friendships and experiences that I have made in AHCA and throughout the horse world. Teri started riding at a young age. As a youth she spent as much time as she could in Texas on her uncle’s ranch. Teri got a nice ranch horse from them to take home to Kansas City. Turned out this horse liked to jump so she began learning a new riding style. Taking lessons at Allendale gave her a great start in dressage and valuable instruction jumping. Teri attended Texas Tech and majored in Park Administration and Agriculture. While there she acquired some team roping and team penning skills. Teri is a student of Tom Dorrance/Ray Hunt training offered by the Legacy instructors. She has attended and hosted clinics for the past 18 years. Teri has judged Hunter/Jumper shows and local saddle club shows around Kansas City. Current judges’ cards held include ETX, EXCA, UHCA and AHCA. Teri is currently working certification in Western Dressage, Working Equitation, and Ranch Horse competition. Return by February 18, 2018. The ballot included in the newsletter has an error. Here is the corrected ballot. We’re sorry for any confusion this may have caused. Please vote by April 22, 2017. Missouri Fox Trotting Horses competing in American Horseman’s Challenge Association (AHCA) events now have the potential of winning special awards from the Missouri Fox Trotting Horse Breed Association (MFTHBA). Two special high point programs will be offered to registered Missouri Fox Trotting Horses. The first will focus on the Top 5 High Point Winners for AHCA competition year which is underway now and will continue through September 10, 2017. Points may be accrued at any ACHA sanctioned event. The ACHA will tabulate the points based on results from each event. No additional recordkeeping is required from participating owners. The MFTHBA will present Top 5 winners custom prizes to recognize their national Top 5 High Point win. To be eligible to receive awards, horses must be registered with the MFTHBA and the current owner must be a MFTHBA member. The second High Point award will be given at the AHCA National Finals scheduled for October 19, 20, 21 and 22, 2017 in Sedalia, Missouri. The MFTHBA will present the registered Missouri Fox Trotting Horse accruing the most points at the event with a custom belt buckle.